The water’s getting warm, temperatures are short sleeve shirt weather, and everyone’s tired of being cooped up inside. Good thing, because the beaches on Okinawa’s main island begin opening this weekend, a week behind the southern Yaeyama and Miyako island groups. Sunday marks the beginning of the water season at Naminoue Beach in Naha City, Zampa Beach in Yomitan, Emerald Beach in Motobu, Okuma JAL Resort, and Nago Beach in Nago City. Each will hold official opening ceremonies, after which the splashing can begin. Beach fun at Okuma JAL Resort costs ¥750 for adults and ¥520 for school age children. Hotel Rsonex at Nago Beach is offering sea kayaking and banana boat rides 11am~2pm at a ¥500 discount. Military beaches at Torri Station, Okuma Joint Recreation Center, White Beach and Oura Wan at Camp Schwab are open, but life guards will not be on duty until April 13th. Rental equipment hours on the base facilities are limited. Tropical Beach at Okinawa Convention Center in Ginowan opens for the season April 21st, but the fun begins a week earlier. Saturday, April 14th will be a fireworks festival, the season’s first on Okinawa. The festival is sponsored by Japan Air Lines. A concert featuring DJ Ozma and three bands kicks off at 4:30pm, with the fireworks lighting up the sky starting at 8pm. Ikei Island Big Time Resort opens beches on April 8th. Kerama Island beaches open April 21st. A few events around the island heralding the beginning of beach season will be the Ishigaki ITU Triathlon April 15th, and a Lily Festival on Ie Island April 21st through May 6th. 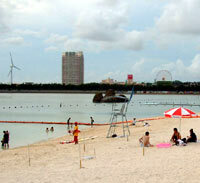 Naminoue Beach is Naha’s pride and joy, located between the city’s two primary seaports. There are actually two beaches‹one city owned, one private‹available for use. The city’s Naminoue Beach is small, but safe and secure. Swimming areas are roped in and protected from water sports enthusiasts, jet skis and kayaks. Lifeguards are on duty daily from sunrise to sunset. Food stands are available within a few meters of the beach. Restrooms and showers are available, and both beaches have smooth, sandy beach. Travel south on Highway 58 to Naha, looking for signs for the right hand turn to Naminoue Beach in the heart of the city. 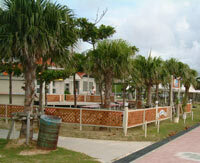 Okuma Joint Services Recreation Facility is located on Okinawa’s far northwest side, north of Nago City. A full recreation complex operated by the Air Force, Okuma has everything from cabanas and cabins to camp sites. Most have been renovated in recent years. Okuma has beach, boats and even a nine-hole golf course. Reservations are a must for anything more than a day visit, as the extremely popular beach is often sold out. The southeast side of Okinawa has a number of secluded beaches with limited facilities and services. Most offer excellent snorkeling opportunities. Several worth mentioning are Azama Sunsun Beach, Komaka Beach, Hyakuna Beach and Mibaru Beach, all located on Highway 331. To reach Highway 331, travel south on Highway 331 to Yonabaru Town, where 331 picks up.